Jennifer, David, and Kade enjoying their last meal before flying from Boston en route to Copenhagen. On Friday, May 27, Laura and Noel took off from Boston Logan International airport at 9:00 p.m., arriving at 7:00 a.m. (Saturday, May 28) in Rejkavik, Iceland. They then continued their journey east to Frankfort, arriving at 1:00 p.m. From there, they took two separate trains to Tübingen. Under the close supervision of Laura, Noel took a nap on the floor of the train. Much to his surprise, several elderly German women approached his sleeping body. The women were concerned he wouldn’t wake to get off the train at the final stop. The women preceded to poke him and exclaimed, “Aufwachen! (wake up)!” Needless to say, Noel and Laura made excellent time! Noel prepares for his slumber on the train from Stuttgart to Tübingen — only to be woken up by elderly German women! David planned to leave Kansas City, MO on Thursday, May 26 with intentions of meeting Chris Lane in Boston. However, due to a confirmed tornado touchdown miles from the KC airport, all flights were canceled after multiple rebookings. He took a flight out at 7:00 a.m. on Friday from MCI through Philadelphia en route to Boston. After a quick stop at Chris’s apartment, they were back at Boston Logan, where they met Kade and Jennifer. The group of four departed Boston at 5:30 p.m. for a direct flight to Copenhagen, arriving at 7:15 a.m. Due to an extended layover in Copenhagen (realized much in advance), the four decide to explore Copenhagen. We took a train from the airport to the downtown area. From delightful pastries to a scenic walk along the canal, the four aimed to stay awake in order to beat the jetlag and maintain as normal a sleeping schedule as possible. Jennifer, Kade, Chris, and David met with organist, Lars Sømod, at Vor Frelsers Kirke. The original instrument was built in 1698. The carved wooden façade is perhaps one of the most ornate wooden façades in the world. The organ was built for King Christian V. With restorations occurring during the late nineteenth century and 1960s, pipes were installed. However, it was clear the difference in sound between the recently added pipes and the original pipes from the end of the 17th century. Jennifer, Kade, David, and Chris took an opportunity to play the fine instrument – playing works by Bach and Buxtehude. After visiting the Vor Frelsers Kirke. the group took a train back to the airport and flew from Copenhagen to Stuttgart. In Stuttgart, the group met Gianmarco at the airport. Gianmarco had been in Europe for the last couple of days on his own. The group of five then took two rental vans to the new residence for much of the trip, an apartment in a charming area of Tübingen. 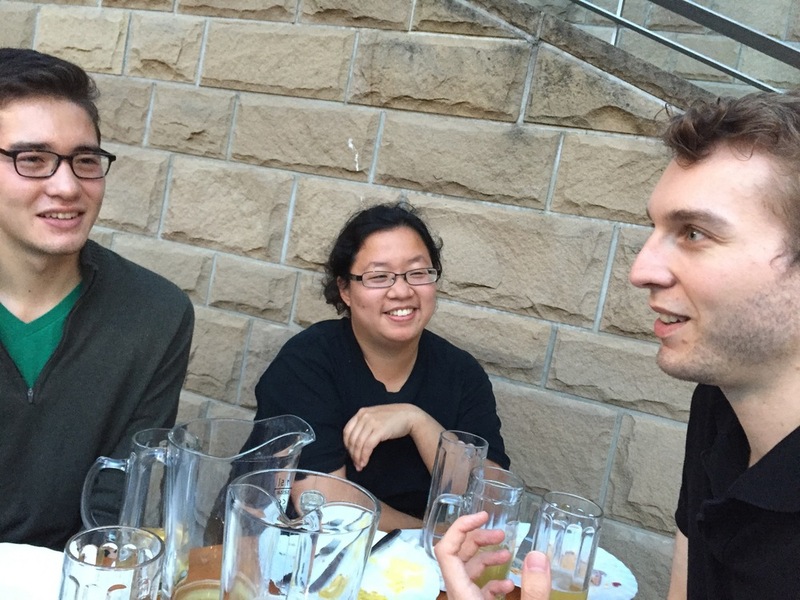 Once in Tübingen, everyone met up with Andrew Ulmer. Andrew, a former biology masters student at Harvard for two years, is a native of Germany. He studied with Chris for two years during his time at Harvard and currently studies organ in Tübingen. Andrew took the group to a Beer Garden for dinner, where we ate diverse kinds of authentic German food. Noel, Jennifer, and Andrew enjoying German food at the Beer Garden along waterside. The group enjoyed Biergartenwurst, a flavorful sausage and watched the many people enjoy punting and kayaking throughout the water. On our way home, we picked up groceries from the local market to do some cooking for breakfast and dinner tomorrow night. (Markets and restaurants are closed on Sundays in Tübingen). Kade registers while playing at the Stiftskriche in Tübingen, Germany. The group visited the Stiffskirche in Stuttgart, with a private tour by Andrew late that night. The group ended the day exhausted, but happy and excited for the adventures to come!